Report from India: Where Have the Birds Gone? One January morning in 2007, birdwatcher and photographer Anand Arya was on his regular morning bird walk at the Okhla Bird Sanctuary in Delhi, when he got talking to a boatman. The boatman was not impressed by the birds and Okhla, boasting that there were far more at his village lake, Bil Akbarpur in Dadri, Uttar Pradesh, about 40km from Okhla. A hitherto unexplored new birding hot spot is one of those holy grails of birding; and so Arya made the trip to Bil Akbarpur. He found thousands of birds; waterfowl, resident water birds, song birds, and raptors—more than in Okhla, in terms of the number of species. Among the birds sighted was the Bristled Grassbird (Chaetornis striatus), a species endemic to the Indian subcontinent, and a globally threatened bird according to International Union for Conservation of Nature (IUCN) Red List of Threatened Species. Arya, a 66–year–old management consultant, tirelessly recorded the presence of the bird on subsequent visits to Dadri, even as he fought a losing battle in the courts to save his own backyard—the forested area adjoining the Okhla Bird Sanctuary where around 9,000 trees were felled by the Mayawati government to make way for Dr. Babasaheb Ambedkar Memorial Park. 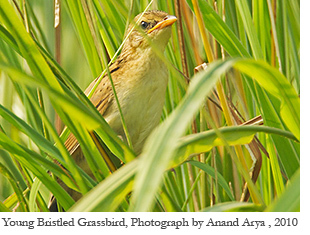 In August last year, on a visit to Dadri, Arya observed that the Bristled Grassbirds he had spotted were gathering nesting material. His trips became even more frequent after that, as he sought to find out if the birds were breeding in the tall grass beds common in Dadri. In September, he saw a female carrying food. In November, he got a glimpse and photographed a juvenile. 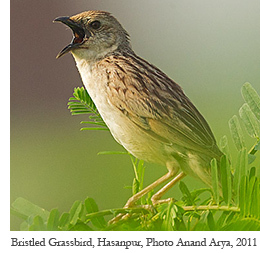 This is the only breeding record of the Bristled Grassbird in India. The Bristled Grassbird gets its name from five strong bristles set on a movable flap of skin that the bird moves back (almost as if on a hinge) to protect the eye as it moves through dense, sharp–leaved grass where it is generally found. This enigmatic bird is slightly smaller and slimmer than the Jungle Babbler (popularly known as the Seven Sisters) that frequent backyards and city parks—a bird with a short, thick bill and streaked heavily with brown–buff. Not much is known about the Bristled Grassbird and records of sightings are scarce. In the past few years, the bird has been spotted a few times in and around the National Capital Region of Delhi, in Corbett Tiger Reserve and most recently in the Naliya grasslands of Kutch district, Gujarat. The Gujarat sighting comes almost 100 years after the bird was last seen in that area. At Dadri, Ansal Properties and Infrastructure Ltd (Ansal API) has launched an ambitious 2,500–acre township project, buying out prime agricultural land from farmers at around र50 lakh (about US $115,000) an acre, according to an Ansal executive who did not want to be identified. The township, branded “The Megapolis,” is extendable to around 9,000 acres and the company plans to invest र26,800 crore (over US $6 billion) over the next five years for its development. In addition to this housing project there is the 280–acre Shiv Nadar University which is right at the edge of the wetland, and is being built at an estimated cost of र600 crore (about US $138 million) according to a press release from the university. A portion of this area around Bil Akbarpur belongs to the Dalit tribal community which got this land under the Bhoodan (land–gift) movement of the early 1950s—a land reform movement started by Acharya Vinoba Bhave in 1951. “One cannot sell off this land as it is a gift from the government under the Bhoodan Andolan,” claims Arya. The fertile agricultural land and water bodies in Dadri were also in recent news when the the Allahabad high court quashed the Uttar Pradesh government’s notification for use of emergency powers to buy land for Anil Ambani (Indian business tycoon) group’s 8,000 megawatt Dadri power project. “The nexus between the district collector, the patwari and the builders leaves very less options for the land owners. They are forced to sell the land within a fixed price. Huge tracts of farmland and marshland are being turned into concrete jungles,” says Arya. The problem is, farmland and commons are not sanctuaries. Nor are they wetlands in the government’s mind. A bird as plain–looking as the striated grassbird—at least to the untrained eye (birders find even ordinary looking birds beautiful) is unlikely to be noticed. The area around Bil Akbarpur may have been christened, The Dadri Wetlands by birders, but it isn’t one according to the ministry of environment and forests’ National Wetland Inventory and Assessment released earlier this year. Nor are two other birding hot spots close to Delhi—near Basai (close to Gurgaon) and Najafgarh. And even when a birding site is recognized as a marsh or wetland, it does not guarantee the safety of birds. The Pallikaranai marshes in Chennai for instance, are protected but ringed on all sides by buildings, including several high–rises occupied by IT companies. Wetland ecosystems account for around 6% of the global land area and are among the most threatened of all the environmental resources. Wetlands have long suffered significant losses and continue to face an ongoing conversion threat from industrial, agricultural and residential developments. The disappearance of commons and wetlands affects immediately the number of bird species recorded in a region. Delhi boasts a checklist of 500 species of birds, the second highest in the world in a city (after Nairobi), but in recent years, even during peak birding season, birders record a maximum of 271 species—the number was recorded during a bird count in March 2005—a whopping nearly 50% decline. Of the 500 bird species, 45 species including the Lesser Florican, and Little and MacQueen’s Bustard have not been sighted since the early 1970s, and 250 species are termed “scarcer” in the Atlas of the Birds of Delhi and Haryana. 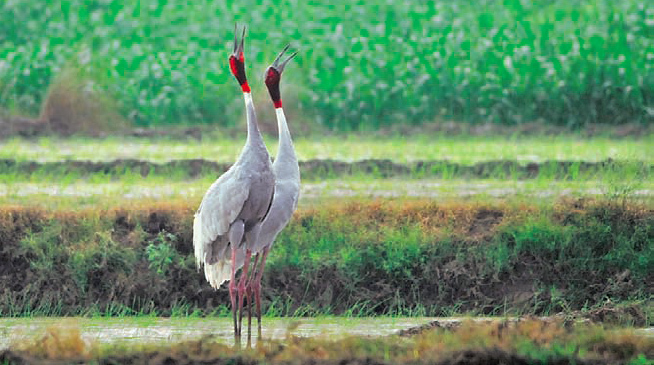 Sultanpur National Park and Bird Sanctuary, which is situated a few kilometres away from Gurgaon, used to have rolling hills as the backdrop to its lake filled with Sarus cranes and other water fowl. The hills are gone and with every passing season the line of skyscrapers draw closer and closer to the sanctuary. extirpated in many parts of its former range. It’s the same story in other cities. Kolkata lost its salt marshes, still known as the east Calcutta wetlands, to the development of the Salt Lake city. Sumit K. Sen, who runs the Birds of India website says that “even as late as the 1970s, there was nothing but salt marshes covered in tall reed–beds. It used to attract thousands of waterfowls in winter and I remember seeing huge numbers of geese, ducks and waders. It was a true avian paradise till land–filling wiped off the wetlands.” Indeed, 70 species including Black Baza, Red–crested Pochard, Spot–billed Pelican, Laggar Falcon, Black Eagle, Pallas’s Fish Eagle, White–winged Tern, River Tern and Rock Eagle Owl are no longer seen in Kolkata, according to Sen.
“In the last 15 to 20 years, every vacant plot of land, including playgrounds where children played football and cricket, and ponds have been converted into housing complexes,” adds Sen. In Guwahati, the demise of wetlands has seen adjutant storks—the city boasts half the world’s population of these birds—end up as scavengers on rubbish heaps. Bangalore’s tony Koramangala area has come up where a water body once used to be. Author and birder Bikram Grewal recounts birding in the area when he was younger. Between 1973 and 2007, the number of water bodies in Bangalore fell from 207 to 93 according to a research paper titled Wetlands of Greater Bangalore, India: Automatic Delineation through Pattern Classifiers by Ramachandra T.V. 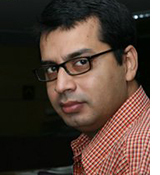 and Uttam Kumar of Indian Institute of Science, Bangalore. Arya and other birdwatches who have been to the Dadri wetlands will be hoping that the lake at Bil Akbarpur doesn’t go the same way—for the sake of the Bristled Grassbird. Counter Currents | Sanctuary Asia | Truthout | and YubaNet.